The Soviet collapse left sailing high and dry but a new generation is hoping to recapture past success. Cast adrift by the collapse of the Soviet Union, Russia’s competitive sailors have spent the past two decades trying to resurrect a tradition of nautical success. Now they could finally have the wind in their sails. Russia’s sailing history goes back to one man, Peter the Great, who travelled Europe to find ways to modernise the country. • 1697 Peter the Great visits the Netherlands to learn the art of shipbuilding. • 1912 Russia wins its first sailing medal with a bronze at the Stockholm Olympics. • 1980 The Moscow Olympics holds the sailing event off Tallinn, which is now Estonia’s capital. From the start, sailing was a major focus of Peter’s efforts as he tried to create the first real Russian navy and base it in his newly created capital of St Petersburg, on the formerly Swedish-ruled Baltic coast he had conquered. In 1698, he visited Deptford Dockyard in south-east London incognito to learn shipbuilding techniques and even served an apprenticeship with Dutch boatbuilders, learning the skills to pass on to his subjects. Even now, Russian nautical terms such as matros (seaman) and grot (mainsail) come from the Dutch language. That tradition was still going strong in 1912, when a team of Russians and Germans from St Petersburg won a bronze medal at the Stockholm Olympics. Their world as gentleman yachting enthusiasts was swept away by the Russian Revolution five years later, but the seeds of a competitive sailing tradition had been sown. Stalinist repression and the Second World War meant that yacht clubs were hardly a priority in the decades that followed, before Muscovites Timir Pinegin and Fyodor Shutkov won the first Olympic sailing medal for the Soviet Union in 1960, sailing their boat Tornado to gold in Naples at the Rome Games. The Soviet Union was a respectable mid-level power in world sailing, amassing a further 11 medals before the country collapsed in 1991. Soviet-trained sailing veterans won newly independent Russia a couple more Olympic medals, but the last of them came in 1996, just as geography started to bite. Russia has a lot of coastline but much of it is frozen, home to military installations or otherwise unsuitable for sailing. Tallinn, which hosted the Olympic sailing when the Soviet Union staged the Moscow Olympics of 1980, was now the capital of independent Estonia, while Ukraine retained a strong talent pool of sailors in the post-Soviet world. Russia was left isolated, Peter the Great’s ship becalmed, as sailing developed and other nations sped ahead. However, there are now signs that the wind may be changing. The project quoted above is the Gazprom Youth Sailing Challenge, which combines the wealth of Russia’s state gas company with the expertise and traditions of the St Petersburg Yacht Club to help train a new generation of competitive sailors. The numbers involved are small – no more than a few dozen – but the project has done well to find talent from all over Russia, with sailors from St Petersburg, the southern Black Sea coast and even Vladivostok in the Far East. The Gazprom Youth Sailing Challenge enters a boat in the championship tour of the RC44 class, a competition for a relatively new type of keelboat that does not yet have Olympic status, but is becoming the focus of Russia’s sailing revival. Besides Gazprom, three more Russian teams are in the competition: one of them, Synergy, currently leads the match race rankings after two championship rounds. In the main fleet race rankings, Synergy is third behind two British boats. With continued support and a little luck, these projects could put Russia back on course in the world of competitive sailing. Synergy is one of the top Russian crews and competes in the RC44 keelboat class. Founded by businessmen Valentin Zavadnikov and Leonid Lebedev, the team made its debut in 2010 and partners Russian sailors with American expertise in the shape of coach Ed Baird and tactician Ed Reynolds. Synergy leads the field of 15 teams in the match race standings after the first two of this year’s five tour events, which took place in the British Virgin Islands and Portugal. It currently sits in third place in the fleet race ranking. 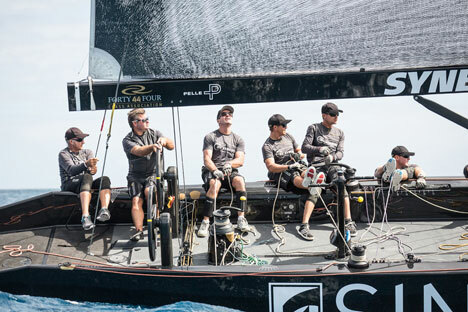 Synergy has steadily improved its position since entering the competition, rising from 12th place in its first two seasons to sixth in 2012, before finishing second in the RC44 championship last year. The next stop will be Sotogrande in Spain, near Gibraltar, at the end of June. The championship then heads to Marstrand in Sweden in August before the final tour event in Muscat, Oman, in November.